Phil graduated from California State University, Chico in 2001 with a major in anthropology and a minor in geology. He continued to pursue his interest in geoarchaeology while at Sonoma State University where he received his Master’s in 2006. His thesis examined spatial changes in the shoreline of North America over the past 15,000 years to identify where evidence of the earliest human occupation may be found today. He has been a professional archaeologist since 2000, working as an Archaeological Technician for the US Department of Agriculture Forest Service and several private firms throughout the western United States, as a Geoarchaeologist for the Anthropological Studies Center at Sonoma State University, and as a Geoarchaeologist and Field Director at Far Western since 2008. 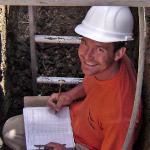 His current research interests include Quaternary geology and landscape evolution, which is applied during geoarchaeological investigations searching for deeply buried archaeological sites utilizing a variety of exploration and dating techniques. Furthermore, his background in geoarchaeology has led to a strong interest in archaeological site formation processes and he is often employed to document and analyze stratigraphically complex archaeological sites, as well as lead small- and large-scale archaeological excavations.